hallelujah. 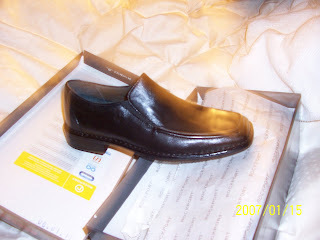 dennis finally picked out a pair of "business formal" dress shoes. did I mention that he is so picky? For how I see that shoe I can say that the pair of shoes is very good. Nice formal pair of shoes. Thanks for passing by to my blog and for your comments. Yup, it's so cold outside here that the snow has turned into ice on the sides of the roads and highways and of course has not melted yet, as we have been from -1 to -8 grades centigrades since Wednesday so far. I thank God about the wood stove and heater at home, so we can stay warm. Take care and have a very nice rest of the week. I like your new layout Erin.